Since the inception of the Resource Family Approval (RFA) program in California, there have been many questions surrounding this new program. Questions about what a resource family is, how long it takes to adopt a child in California, and of course what the entire process looks like, start to finish. It might seem as if the RFA process is a more complicated endeavor compared to the “old way,” of gaining guardianship approval, but in reality it's actually much more efficient. The RFA program actually combines elements from the former foster parent licensing program, relative approval program and the adoption/guardianship approval process as well, to create a new consolidated approach. As a result we now have a nice bundled track that we can offer our families who are in need of gaining RFA approval status to fulfill their family needs. 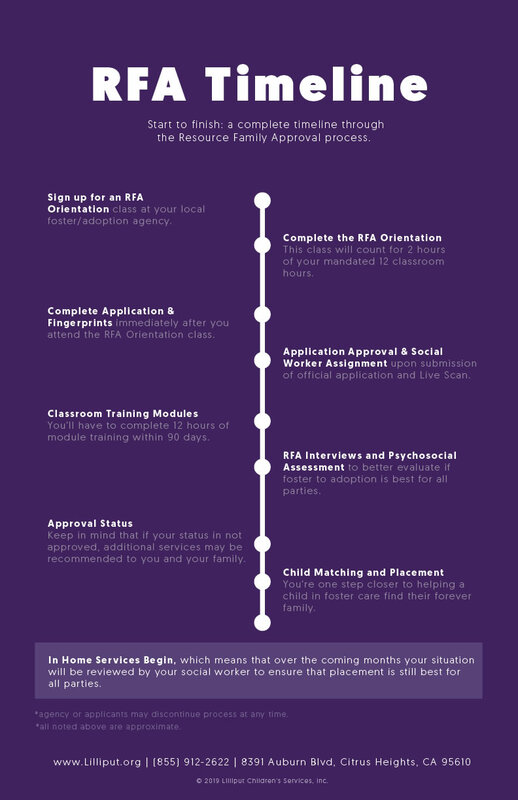 Below is the full Resource Family Approval (RFA) Program Timeline start to finish. If you are interested in Foster or Adoption in the state of California, this is what the process will look like. Whether you are recommended to us, interested in adoption, or simply meet one of our friendly team members in the community, your first step in this process is to sign up for an orientation. An orientation class is where you will find out more information on the California foster to adoption process. These classes are by no means a commitment to foster or adopt, they're simply intended to provide more information on the process. If you decide to proceed, the orientation class will count for 2 hours of your mandated 12 classroom hours. After you attend the RFA Orientation class you will have to turn in your official application along with your receipt showing you had your fingerprints captured at an authorized Live Scan location. Once your application is approved, you are then matched with a Lilliput Families Social Worker! The positive about this stage, is that your social worker will now be with you for the rest of this process. They are available to help with questions, courses and anything else that may come up. At this point in the process you are now allowed to start the Training Modules. In order to gain your RFA Approval status, you'll have to complete 12 hours of module training within 90 days. At this stage you (and your family) will begin the RFA interviews and psychosocial assessment. Think of this stage as a more in depth one on one assessment of your family, situation, desire to grow your family, and your home (or routine). This is all to better assess whether or not foster to adoption is best for you (and your family) and the child (or children) who may be placed in your care. With everything completed to this point, it will be determined if your family is approved to be a Resource Family and begin caring for children in the California Foster Care System. Keep in mind that if your status is not approved, additional services may be recommended to you and your family. This is when the magic happens! You and your family are one step closer to helping a child (or children) in foster care find their forever family. At this stage you're opening your hearts and home to a child (or children) in foster care with the placement of a child (or children) in your care. This is one of the final stages to the whole process, and at this point, your child (or children) have been matched and placed in your care. Over the coming months you will be reviewed to ensure that the placement is still ideal for all parties. This is all in an effort to achieve the best permanent situation for the child (or children) in foster care. If you are at all interested in learning more about this process or if you are ready to stand up and be that hero to a child in foster care, please sign up now and join us at our next RFA Orientation class.